Germans have long been on the cutting edge of technology and the fine arts. Much of the world's best music, art, timepieces, engines, aircraft, guns, and other devices have emanated from there. Notables like Einstein, von Braun, Heisenberg, Planck, Gauss, Kepler, Helmholtz, Kirchhoff, Hertz, and Fraunhofer - all German - are almost certainly familiar to all RF Cafe visitors. This article demonstrates the voraciousness with which the Germans sought to engage in science exploration. It is very unfortunate for the German people that a couple maniacs like Wilhelm II and Adolph Hitler were permitted to launch their country into wars that both times ultimately ended in defeat and humiliation. Nowadays it seems, IMHO, the country is attempting to atone for past behavior in the form of self-flagellation by inviting an overwhelming number of unvetted, unskilled foreigners to overrun the country. Japan is not committing national hara-kiri; neither should Germany. 15-watt short-wave station, transmitter and receiver with pedal-driven dynamo for exciting the transmitter. 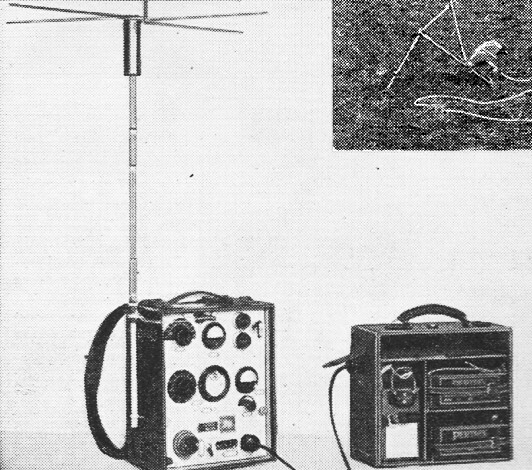 Portable short-wave transmitter carried on the back with a special harness. Among the European nations, Germany is at present the most air-conscious one; German boys of today desire to fly as eagerly as they wanted to be a treasure-hunter, or a cowboy and trapper 20 years ago. Since motor-driven planes are not cheaper in Germany than elsewhere the boys construct their planes. These planes are, of course, only motorless ones - so-called gliders - which are built in the school machine-shop with the help of an air-minded teacher. Each of the boys contributes as much money as his parents can afford. This money is used by the teacher to buy the raw material for the glider-plane to be constructed, and if the plane is ready the students have a chance to enjoy the thrill of flying by taking a so-called "Gleitflug-Kursts" (Lessons on how to pilot a glider-plane). Since such a glider-plane is not able to carry two persons, the instructor - often an army pilot - is able to communicate with the student-pilot, high up in the air, only by means of yelling and gestures, an instruction method which is of course not sufficient to prevent bad crashes, sometimes ending with the destruction of the glider. To avoid these unwanted accidents the instructors are now using small portable telephone transmitters to communicate with the student-pilot. Despite the fact that the output of these transmitters does not exceed more than 1 (one) watt, and only a small telescopic antenna is used, these transmitters operating on a wavelength between 60 and 100 meters often bridge remarkably long distances. 1-watt short-wave set and battery container at the right. 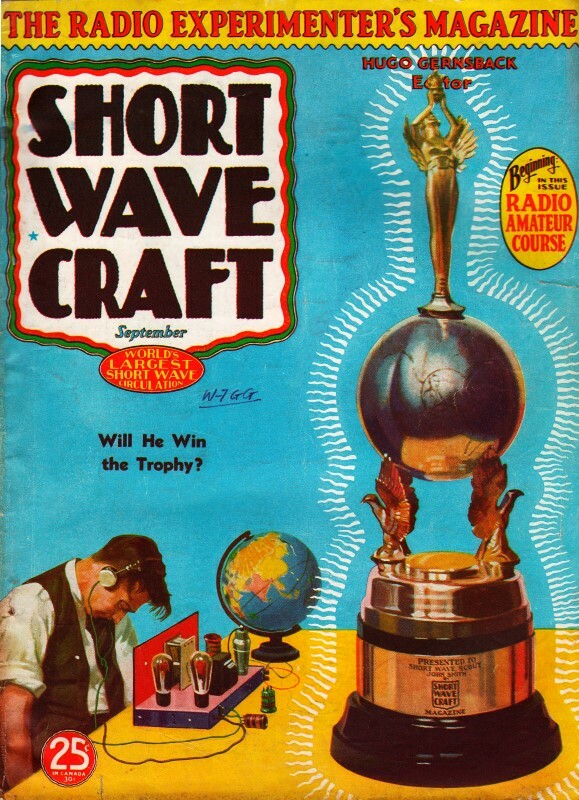 Short-wave portable transmitter for use on small airships. 10-watt portable transmitter and receiver. The student-pilot receives the telephone signals by means of a small 4-tube receiver, which is battery-operated. These receivers are not only of very small size but also extremely light. The entire weight, including batteries, is about 7 to 8 .pounds. Headphones installed in the pilot's cap, serve as the sound reproducers. 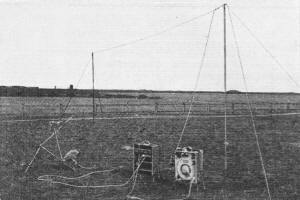 A horizontal hanging wire about 18 feet long is used as the antenna. Sometimes the guy wires of the plane do the trick as antenna. 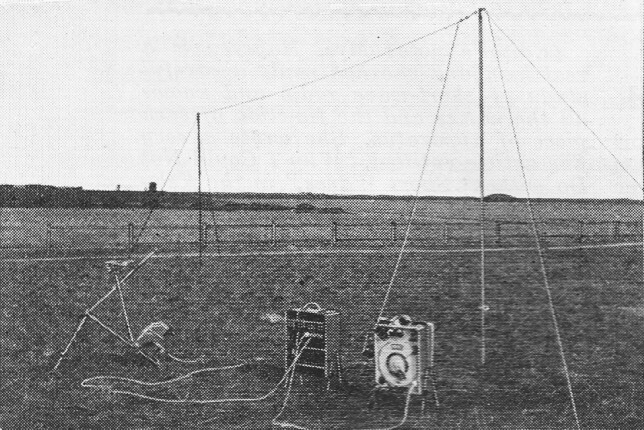 While these transmitters of 1-watt output are used by small glider-schools only, the larger training camps have transmitters of about 15-watt output. The instructor then has the opportunity of contacting the student under all circumstances. Each of the glider-planes has for that reason a certain number, and interested short-wave listeners often have a chance to hear the instructor calling for example a certain plane: "Glider No. 567, do so and so," or if the weather conditions are not favorable: "Calling all gliders, calling all gliders, to go down!" These 15-watt transmitters are divided into three handy boxes, which are carried by the students like knapsacks on the back. One box contains the transmitter. The second one the aerial supports and the antenna wires, and the third one the power source, the pedal-operated generator, used like a bicycle. The pedal generator is so designed that it may be folded up in a few minutes. Each of the boxes has a weight of about 50 pounds. As experience shows such a station may be put in operation in a time not exceeding two minutes after arriving at a certain place, this time includes the erection of the aerial supports and the antenna wires. 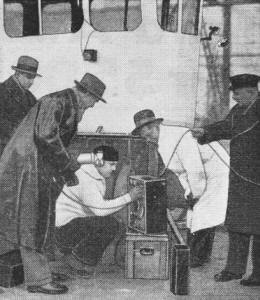 Similar transportable transmitters completed by a fitting transportable receiver are often used for communication purposes in case of sport events and political demonstrations. Telephony and code traffic is used in all such cases. Such a station is very often installed in a small dirigible to supervise traffic regulations, etc., from above. The German Broadcasting Co. is using portable 10-watt transmitters for reports about interesting events direct from the spot. Often a special communication car, furnished with several short-wave transmitters is in use. However, in all cases where such a large car cannot be used, a small 10-watt transmitter, divided into three or four boxes, is employed for the transmission. These transmitters are of a relatively light weight and easily bridge distances of 10 to 15 miles. Another very interesting type of portable short-wave station, also operating on a wavelength of 60 to 100 meters, but often furnished with a continuously variable wave range from 40 to 2,000 meters, is used by the German army. These very small stations, having an output only of one watt, may be used alternately for telephony and code transmission. If the code-key is touched, a small buzzer operating as a tone generator, modulates the transmitter. A very sensitive 5-tube superhet, with seven tuned circuits, gives a selectivity so high that many stations operating in near-by channels may be used at the same time without any danger of mutual disturbances. These small army stations are, despite their small output of one watt, very efficient. Despite the fact that a very simple "L" antenna is used, 20 miles are easily bridged where code is transmitted. Telephony is transmitted over distances of 10 to 12 miles easily. The operator has a normal French-type telephone for telephone transmission. Since these stations are working in two-way traffic, a very interesting trick has been used to cut-off the receiver when the transmitter is used to radiate the telephone signals. The microphone currents are fed into a rectifier, which operates as a kind of combination between a squelch-circuit and an A.V.C. system. If the microphone is in operation, the bias voltage of the receiver is automatically changed and the entire receiver is cut off. Since the time-constant of this cut-off system is very short, a regular two-way conversation can be carried on. The entire station is divided into three small portable boxes of about 25-pound weight for each part, and a small hand-driven generator is used as power source.